The UK and North Atlantic winter storm season have already smashed the record for storms with hurricane force winds, and the season can potentially last another month. "Blues indicate areas with wind speeds that were higher than the 1981-2010 average; browns indicate winds were lower than average. Most of the Northern Hemisphere is awash with white and muted blues and browns, indicating winds were not especially different from the long-term average for this time of year. 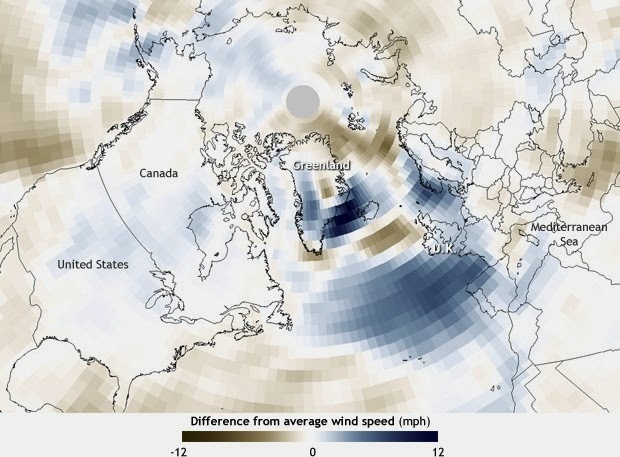 In the North Atlantic, however, an unusually high number of hurricane-force storms have left splashes of dark blue off southeastern Greenland, Norway, Europe, and the western Mediterranean." "Between the first hurricane-force event of the season on October 25, 2013, and March 8, the most recent one to date, 43 unique hurricane-force events have blasted their way across the North Atlantic. According to NOAA’s Ocean Prediction Center, 20 separate hurricane-force wind events occurred during January through February alone, and 14 of them had low-pressure centers that underwent the rapid intensification that meteorologists call bombogenesis, in which the storm’s central pressure drops by at least 24 hPa in a 24-hour period. Between October 25, 2013 and March 8, 2014, thirty of them underwent rapid intensification. The most intense system occurred on December 24, 2013. The pressure in the heart of that storm dropped to 929 hPa as the storm lurked north and northwest of the British Isles. During January and February, 2014, 8 of the low centers had a central pressure below 950 hPa. "In comparison, the hurricane-force storms totals for 2012-2013 were a bit lower, with 41 unique hurricane-force events between October and April. Only 22 storms had low-pressure centers that underwent rapid intensification—8 fewer than this winter to date. Last year’s (2012-2013) final event occurred on April 19th, 2013. The 1200 UTC, December 5, 2013 pressure map, showing a deep area of low pressure bringing strong winds to the north-east of the UK. Maximum wind speeds of 5 to 6 December 2013 varied widely at 60 to 70 kt across Scotland, with Altnaharra (Sutherland) recording a gust of 81 kt (93 mph). The mountain station at Aonach Mor (at an elevation of 1130 m a.s.l.) recorded a gust of 123 kt (142 mph). Gusts also exceeded 60 kt along North Sea and Irish Sea coasts and over 70 kt in the Western Isles. The frontal boundary and surface pressures of 19 December, 2013, 0000 UTC depicted a deep area of low pressure to the north-west of Scotland. This storm brought maximum gust speeds 18 to 19 December 2013 of 60 to 70 kt around exposed coastlines of the north and west, with gusts exceeding 70 kt in the Western Isles, South Wales and South Coast. A gust of 74 kt (85 mph) was recorded at Plymouth and 82 kt (94 mph) at Needles Old Battery (Isle of Wight). Winds reached over 100 kt across the Scottish mountain summits. The frontal boundary and SLP map of December 24, 2013,1200 UTC showing an exceptionally deep area of low pressure to the north-west of Scotland. The 927 mb reading is one of the lowest ever recorded for a North Atlantic Winter Storm. The December, 2013 Christmas Storm brought more winds that gusted at 60 to 70 kt across much of Scotland, the coast of Wales and South Coast of England. A gust of over 100 kt was again recorded across Scotland's mountain summits. Large areas of the UK experienced gusting winds of 50 to 60 kt, with the strongest winds around Irish Sea coasts. Aberdaron and Capel Curig (both Gwynedd) recorded gusts of 95 kt (109 mph) and 82 kt (94 mph) respectively, while Cairngorm Summit (1237 m a.s.l.) recorded a gust of 119 kt (137 mph). This last reading is equivalent to a Category 4 hurricane wind speed! December 31, 2013, 1200 UTC found the UK facing another strong low pressure bringing further strong winds and heavy rain. Fortunately, the winds were not as strong, but the rains were what did greater damage with flooding. Maximum wind gust speeds on January 3rd reached 60 to 70 kt around exposed coastlines of the south and west, with 92 kt (106 mph) at Needles Old Battery (Isle of Wight) and 71 kt (82 mph) at Mumbles Head (Swansea). The most significant January, 2014 storms occurred 25 to 26 January, 31 January to 1 February, 2014. The surface pressure chart for 1200 UTC, January 26, 2014, depicts a deep area of low pressure to the north-east of the UK bringing strong winds and heavy rain to much of the UK. The map below shows maximum gust speeds 25 to 26 January 2014. Winds gusted widely at 50 to 60 kt around exposed coastlines of the west and north, with 70 kt (81 mph) at South Uist (Western Isles). Taken individually, this storm was notable but not exceptional for the time of year. January 31 to February, 2014. The January 31 to 1 February 2014, storm is revealed in the map below, showing another deep area of low pressure over Ireland. Maximum gust speeds for 31 January to 1 February 2014 varied around 50 to 60 kt along exposed coastlines of the north and west UK - comparable with the storm winds of 25 to 26 January - with 73 kt (84 mph) at Aberdaron (Gwynedd). February brought no relief for the UK from hurricane-force storms. Major hurricane force storms occurred on February,4 to 5, 8 to 9, the 12th and 14 to 15. The photograph below provides some indication of weather impacts experienced from these storms. This storm was more severe across south Wales and south-west England where winds gusted at 60 to 70 kt widely around exposed coastlines. St Mary's Airport (Isles of Scilly) recorded a gust of 80 kt (92 mph) and Berry Head (Devon) 79 kt (91 mph). This storm damaged the South West main line railway at Dawlish. Synoptic situation at February 8, 2014, 0600 UTC showing the next storm and deep low pressure system to the west of Ireland. Wind speeds were comparable with the previous storm and again gusted at 60 to 70 kt around the coastline of south Wales and south-west England, with 80 kt (92 mph) at Needles Old Battery (Isle of Wight). February 12, 2014 chart shows the next storm in the series with a deep low pressure system over Ireland. Maximum gust speeds February 12-13, 2014. were the most severe of the sequence, particularly for coastal areas of Wales and north-west England where winds gusted at 70 to 80 kt - and a Met Office Red Warning for wind was issued for this region. Maximum recorded gust speeds included 94 kt (108 mph) at Aberdaron, Gwynedd, 83 kt (96 mph) at Lake Vyrnwy (Powys) and 81 kt (93 mph) at Capel Curig (Gwynedd) - close to record values; the highest gust speed on record for North Wales is 97 kt (112 mph) at Aberdaron on 24 December 1997. This was one of the most significant storms to affect Wales and north-west England in recent decades. Most of these gusts were category 1-2 in hurricane strength! The last of the major storms affecting the UK occurred February 14-15 2014, and the center of the low pressure system to the south-west of Ireland. The coasts of south Wales and southern England were affected by the strongest winds, gusting at 60 to 70 kt or higher. Needles Old Battery (Isle of Wight) recorded a gust of 95 kt (109 mph). This series of storms has produced major rainfall affecting large areas of the UK over the last several months. The UK MET Office produced the following rainfall anomaly map. To emphasize the exceptional nature of the wet weather, the map below plots rainfall totals for this same 67-day period but as a percentage of the 1981-2010 long term average rainfall for the whole year. Remarkably, much of central southern England, parts of south Wales and eastern Scotland received around half a year's worth of rainfall through this period, with a few locations approaching 75% of the annual average in just over two months. Finally, the Azores high is beginning to move in place, deflecting recent North Atlantic storms northward - away from the UK. They are finally beginning to dry out, but there will be challenges with lambing season and crop production to still be totaled. Nice work A4R, it is greatly appreciated.